I’m behind on book reviews! Whoops. So today there will be two reviews posted, just to get them off my to do list. 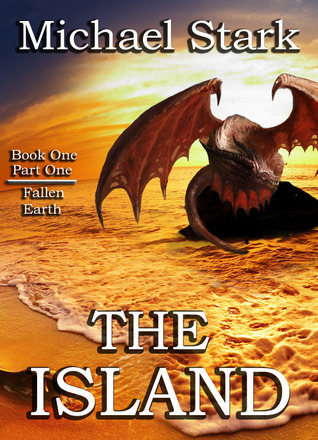 The first is The Island: Book One- Part One of the Fallen Earth Series by Michael Stark. This was a novella length piece that I thoroughly enjoyed. I have rarely been so entertained by someone telling me their story as I was by William Hill, the narrator. The story starts with William slowly realizing that a small news story in Mexico about a fever is slowly becoming a major threat to the world. How he responds to it is both wonderfully believable and poetic. I’ve already written on why I picked this book up in the first place see my post on book covers. William tells his story in the same fashion someone would tell you a long story sitting at a bar or over a cup of coffee, with rabbit trails explaining why people do what they did, memories that surface because something else came up and a deeply personal view of his world, by turns almost apologetic and then again not, because while William recognizes imperfections in the people around him and himself, he seems to have a deep, resigned, almost fatalistic zen worldview. I encourage you to dip into the world of the Island for a view hours and enjoy the telling of this narrative. Telling you much more would spoil it for you. I’ll say this much, the tension and creepiness in the last few pages have me eager for more. Hopefully, I will be back to tell you about Part Two in the near future. This entry was posted in Book Reviews and tagged book reviews, Books, creepy, Fallen Earth, Fallen Earth Series, Michael Stark, poetic, reviews, The Island, William Hill. Bookmark the permalink.